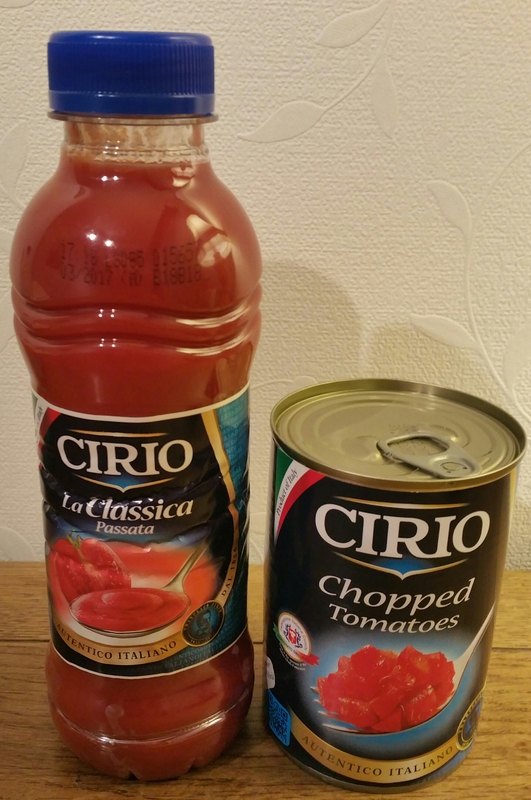 As part of October’s Degustabox I received two tomato products from Cirio, a can of chopped tomatoes and a bottle of passata. As soon as I saw them I could hear a tomato soup begging to be made. 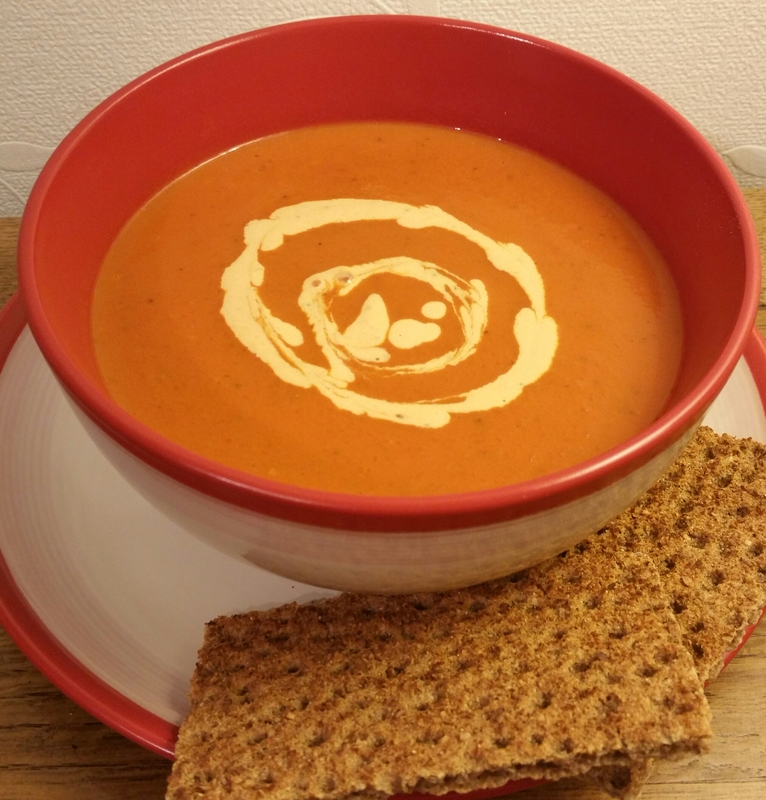 It was a particularly miserable day weather-wise and so what better way to feel warm and cosy than to tuck into a bowl of freshly homemade soup. Because this recipe uses passata and canned tomatoes rather than fresh, it is a quick and easy meal. Most of the ingredients are things you would have in your kitchen anyway so it is a really convenient recipe to use. You don’t need to do the swirl of cream on the top, that was just me trying to be fancy 😉 You know the type of plastic lidded containers that some takeaways come in? This recipe made enough to fill 3 of those to the brim, with a little bit left over. I hope you enjoy it! Heat the oil in a large pan over a medium heat, then add the onion and garlic and cook until the onion is softened but not brown. Add all of the other ingredients except the cream, and stir well. Cover, turn the heat down to low, and simmer for 15 minutes. Remove from the heat and using a hand blender, blend until smooth. Care is needed for this step… if you add the cream straight into the soup, chances are it will split or curdle. The way I’m describing here will prevent that from happening. Put the cream in a jug and add 2 tbsp of the soup to the cream in the jug. Mix well. Add another 2 tbsp of soup and again mix well. This stabilises it and it now won’t split when you add it to the soup. Slowly add the cream mixture to the soup in the pan, mixing well as you add it. Place the pan back over a low heat to warm through again but do not let it boil. Season to taste with black pepper, and enjoy. I have a confession to make – I don’t like tomato soup (or Mac n cheese!!). Your soup looks so lush though, I’m going to make it as everyone else in our house loves tomato soup. I promise to try it!! Great easy recipe. Thank you. Sammie x.